Best Books for RRB JE 2019 CBT-1 Preparation All Engineering Branch. 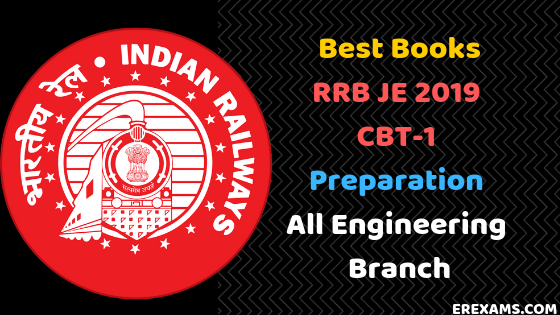 This article provides you CBT-1 Best or Top Books for RRB JE Preparation 2019 for all railway junior engineer branch Electrical, Mechanical, Civil, Electronics, CS & IT. This article provides you Best Books for Railway Junior Engineer Exam 2019 CBT-1 Or Paper-1 Exam Both Hindi And English language. if you are searching railway junior engineer 2019 all study material see my previous article RRB JE 2019 Syllabus & Pattern, Best books, Previous Papers, Notes & Books Pdf Download, this article help you for your RRB JE 2019 preparation. Now in 2019 this year, two examinations of the Railway Examination Junior Engineer 2019 will be held where the first paper will be CBT First and the second paper will be CBT Second, you can see the pattern of CBT First for CBT Second in the table below. Friends, all of you know that the stage first CBT first paper of the Railway Junior Engineer Exam is going to be similar to all the engineering branches, so the book below which I am going to tell you will be useful for all the students of the branches. For the Railway Junior Engineer Examination 2019, I am going to tell you the best book that will help in passing your Railway Junior Engineer Exam 2019 CBT First Non-Technical, here I am going to tell you the best books for Railway junior engineer CBT First in Hindi and English. You can buy them either online or offline from the Book Store. Railway junior engineer exam 2019 Best Books for CBT First to get you the RRB JE 2019 best book Mathematics below this article if your maths is good Then you will pass CBT First Form comfortably with the Railway Examination. In the bottom the best books and mathematics CBT First for CBT Second. You can buy them from the direct link, where 30 questions of Math will be asked in CBT-2. In the table below, you will find the best book for Railway Junior Engineer Examination 2019 General Intelligence and Reasoning. I would like to tell you that 25 questions of Reasoning will be asked in the CBT First in the Railway Junior Engineer Examination. In the table below, you will find the Best Book For Railway Junior Engineer Examination 2019 General Science. I would like to tell you that 30 questions of General Science will be asked in the CBT-1 and 15 questions of General Science (Physics & Chemistry) will be asked in the CBT-2 in the Railway Junior Engineer Examination. In the table below, you will find the Best Book For Railway Junior Engineer Examination 2019 General Awareness. I would like to tell you that 15 questions of General Awareness will be asked in the CBT-1 and 15 questions of General Awareness will be asked in the CBT-2 in the Railway Junior Engineer Examination. In the table below, you will find the Best All In One Study Guide Books For Railway Junior Engineer Examination 2019. I hope you have liked this article and will help you pass your railway junior engineer exam 2019 if you have any questions related to the railway junior engineer exam 2019, you can ask me by commenting below if If you liked this article, then do not forget to share it with your friends; Also, you must subscribe to this website.